Noctilucent-like Clouds in the Winter! Yesterday I read reports about some Noctilucent-like Clouds beeing sighted from Denmark (now also on Spaceweather) and England after sunset. 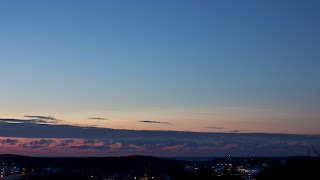 Noctilucent Clouds or NLCs are very faint clouds at a height of about 60-80 kilometres. They are only visible for some time before sunrise and after sunset. Because of the NLCs great hight above ground, they are illuminated from the sun from below the horizon of the observer. In the morning before sunset you can see NLCs to the East and in the evening after sunset to the West. Noctilucent clouds occur during during the summer months on the Northern and Southern Hemispheres. It is usually observed from latitude 50-70 degrees. 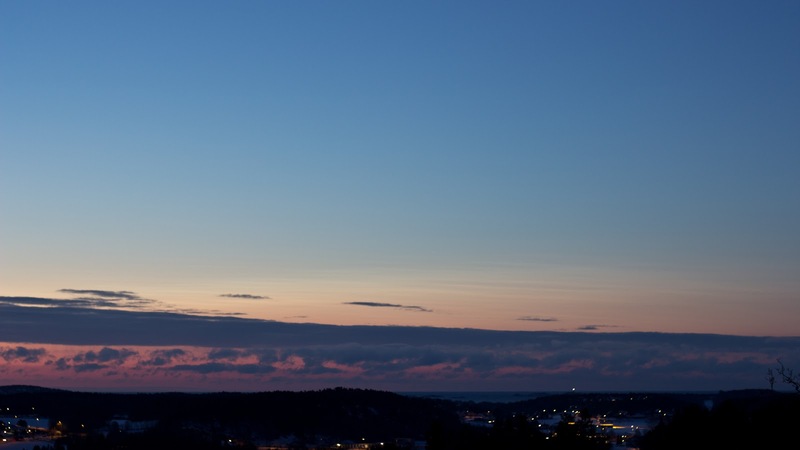 Were I am located in Vestfold, Norway approximately 60° North and 10° East. I was up early today an at 0655 local time (UTC+1 hour) I spotted the NLC about 10 degrees above the horizon to the South-southeast. Here is a timelapse video I made of the clouds. One second of video equals one minute of realtime. Interval was 2 seconds played back at 30 frames per second. The video should be viewed in fullscreen and 720P or 1080P. "We've detected bits of 'meteor smoke' embedded in noctilucent clouds," reports James Russell of Hampton University, principal investigator of NASA's AIM mission to study the phenomenon. "This discovery supports the theory that meteor dust is the nucleating agent around which NLCs form." The meteorid who rammed through the Russian atmosphere spread a cloud of dust. The dust might have aided in the formation of Nocrtilucent-like clouds here in the Northern Hemisphere during the winter. Meteorstøv i solnedgangen!? Grib Stjernene If you can't understand Danish use this link for Google Translate English version. I observed the Noctilucent-like clouds at a height of 10 degrees above the horizon and in the direction of 155 degrees which is South-Southeast. If we estimate the height of the NLC to 50-80 kilometres we can calculate the distance to the NLCs. The meteoride, bolide or fireball above Russia on the 15.02.2013 (D/M/Y) disintigrated above the city of Chelyabinsk which is located at 55°N 61°E, the Captiol of Denmark, Copenhagen is located at 55°N 12°E. Both city's share the same latitude of 55 degrees North. Disclaimer: I am not a scientist so I might have gotten something wrong. Please contact me if you find any mistakes. Sunspot AR 1302 have unleashed some spectacular solar flares which have produced coronal mass ejections, and one of them hit Earths magnetic field on the 26.09.2011 and sparked an geomagnetic storm at the G4(Kp-8) level here in the higher latitudes. 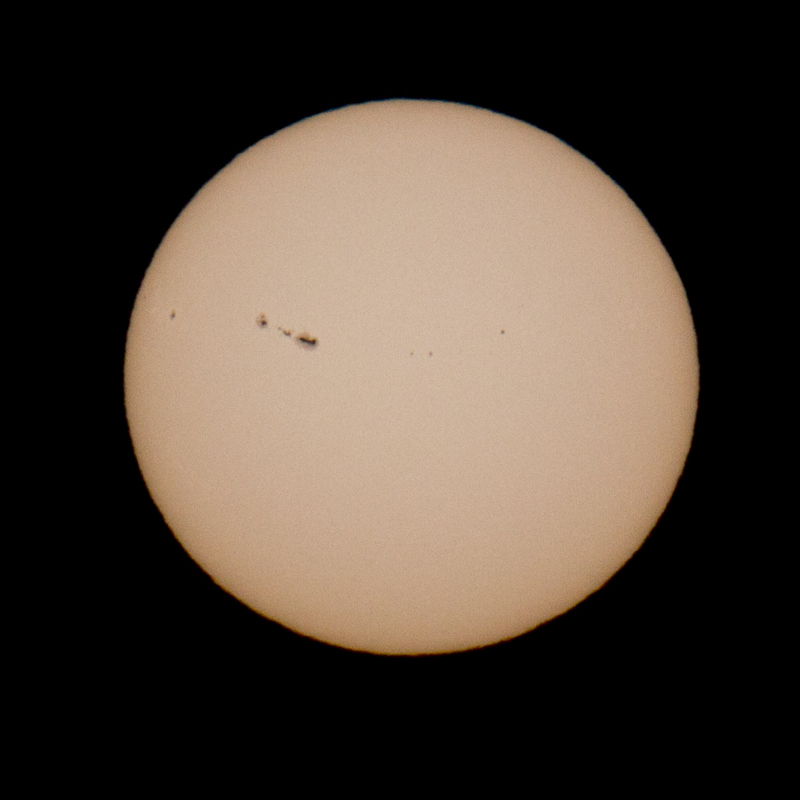 Here you can see a white light image of the sunspot taken today by myself. 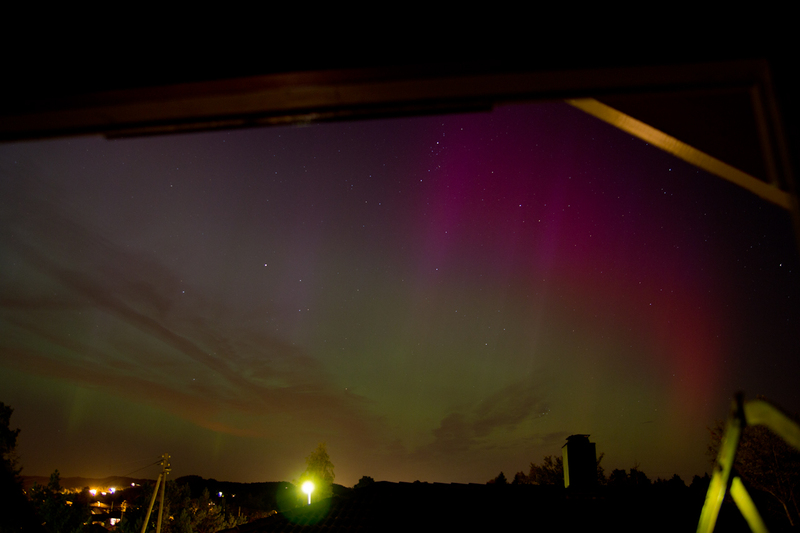 This is the most spectacular Northern Lights I have ever seen here at 59N 10E. With beautiful waves right overhead at zenit and giant columns of light reaching high nearly into space. I took a lot of pcitures with my 60D and I managed to missalign the focus on the most spectaular part, but as the solar cycle is just starting to ramp up, I will get a lot of new chances to make the perfect timelapse of the Aurora Borealis.